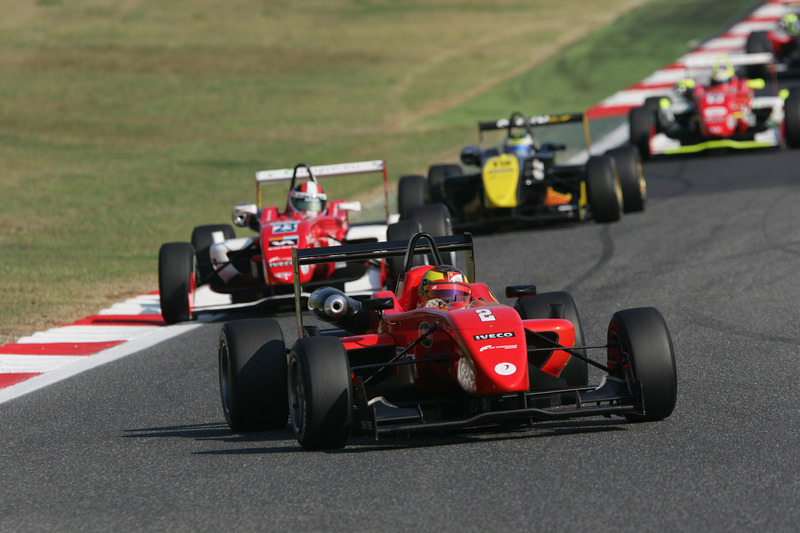 18/09/2011 - The sixth round of the Italian Formula 3 Championship, held at the Vallelunga's race track named after Piero Taruffi, with a solid victory of Brandon Maisano. The French color bearer of BVM-Target capitalized the best position on the starting grid due to the top 8 grid inversion keeping the lead at the start and keeping the rivals at bay thanks to a series of fastest laps. The race pace of the Ferrari Driver Academy pupil, that was actually faster than his best times in race one by at least a second, was out of reach to all the rivals that had to fight behind him. Thanks to a very good start from the fourth spot on the grid, the Argentine Facu Regalia (Team Ghinzani) obtained the second position in the initial stages that made him coming back to the podium after a six races long absence. The third place in the latest six races was always the Brazilian Victor Guerin (Lucidi Motors) who, started from the second place of the grid had to give it away to an all-South-American duel with Regalia in the first laps of the race. The Roman Edoardo Liberati (Team Ghinzani) after the battle at the start with the American Michael Lewis (Prema Powerteam), ended up with the fourth position, while the Californian had to give away his fifth place to the French Maxime Jousse (BVM-Target), author of the second fastest lap of the race and recovering from the sixth position on the grid he was relegated to due to a penalty inflicted by Marshals as a consequence of the bumping with Eddie Cheever (Lucidi Motors) in race 1. The Roman ended today only eighth behind Sergio Campana (BVM-Target) and ahead of Andrea Roda (Prema Powerteam), Federico Vecchi (LineRace-CO2) and Raffaele Marciello (Prema Powerteam) with the latter going wide in the final at Roma corner and spinning when he was tenth; back on track he was in twelfth right ahead of Simone Iaquinta (JD Motorsport) forced to slow down in the final in turn. The classification of the championship now sees Campana strengthening the lead with 111 points, while Maisano got the lead in the Rookies Trophy and brought himself to the second place in the absolute classification at -14 points but enjoying 4 points of advantage to Marciello. Despite the next round being on 2 October at Mugello, the protagonists of the Italian Formula 3 Championship will be on track this Wednesday for the collective test on schedule at the Tuscan circuit. In this occasion, Campana and Marciello will use two new Fiat Powertrain Racing engine units as replacement of those used so far as decided, according to regulations, by Sportive Umpires.